Analysis: Blue's involvement was cut back with the return of Lamar Miller, but it's notable that the Texans didn't activate D'Onta Foreman for Week 17. That suggests Blue will be the top backup in the first round of the playoffs next Saturday at 4:35 pm, when Houston hosts Indianapolis in the AFC Wild Card Round. Analysis: The Texans simply couldn't get much done on the ground as Deshaun Watson had more than three times as many rushing yards as the rest of Houston's backfield combined on the day. Blue drew the start but split touches evenly with D'Onta Foreman and saw three fewer carries. The 27-year-old will probably be relegated to third on the Texans' depth chart if Lamar Miller (ankle) is healthy for Week 17 at home against the Jaguars. Blue will start at running back if Lamar Miller (ankle) is unavailable Week 16 against the Eagles, Aaron Wilson of the Houston Chronicle reports. Analysis: Miller has made steady progress since spraining his ankle against the Jets last week, so there's a chance he'll be ready to go Sunday, but head coach Bill O'Brien remains noncommittal. In the event Miller is inactive, Blue would likely get the call over D'Onta Foreman, who could be active for the first time this year following his recovery from a ruptured Achilles' tendon. Blue carried nine times for six yards and played 77 percent of Houston's offensive snaps in Saturday's 29-22 win over the Jets. Analysis: Blue was given an expanded role after Lamar Miller (ankle) left the game midway through the first quarter. The injury to Miller is not considered major, per Aaron Wilson of the Houston Chronicle, but we need to see how he responds in the coming days as the Texans turn their gaze to a Week 16 road game in Philadelphia. Should Miller be impacted next week, Blue is the logical replacement as the starting running back. 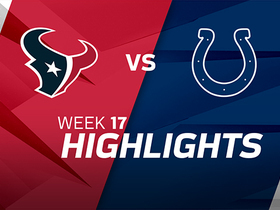 Blue rushed six times for 21 yards and a touchdown in Sunday's 24-21 loss to the Colts. 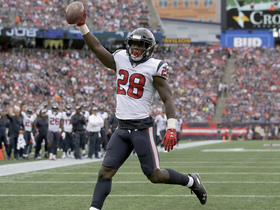 Analysis: After both teams stalled on their first two possessions, the Texans took the ball a third time and engineered an 82-yard drive that culminated in Blue's 3-yard touchdown run. It was his first carry inside the 5-yard line since Week 6 and first touchdown since the opening week. Depending on how Houston wants to use D'Onta Foreman in Week 15 against the Jets and beyond, Sunday might have been Blue's last chance as the No. 2 back. Blue rushed 13 times for a season-high 54 yards in Sunday's 29-13 win over the Browns. Analysis: Houston trails only Seattle in running plays called, so there's lots of work for Blue as the No. 2 back behind Lamar Miller. He hit double-digit carries for the fourth time in five games, but he hasn't found the end zone since Week 1. The running game has fueled the Texans' nine-game winning streak, and they may not want to muck it up by forcing D'Onta Foreman (Achilles) into the mix ahead of Blue. Blue carried 13 times for a season-high 49 rushing yards while catching his lone target for another 13 yards in Monday's 34-17 win over the Titans. 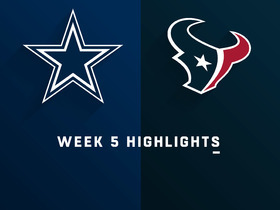 Analysis: The Texans once again favored the ground attack, calling 34 runs to 24 passes. That's been their preferred formula since quarterback Deshaun Watson sustained rib and lung injuries earlier this season. That run-pass mix has led to double-digit touches for Blue, who averages 11.6 carries/receptions per game. However, his usage will be impacted when the Texans eventually activate D'Onta Foreman (Achilles), who is entering the third week of a three-week rehab window. Blue rushed eight times for 46 yards in Sunday's 23-21 win over Washington. Analysis: The 46 yards tied his season high, which came in Week 5 when he started for an injured Lamar Miller. 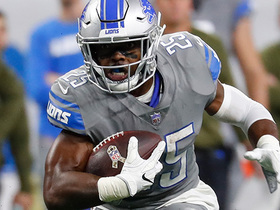 With the Texans shifting focus to a more run-oriented offense, there are opportunities for Blue every week -- he averages 10 carries per game -- but he has just one touchdown. Until he starts getting carries inside the 5-yard-line, Blue is simply a nice-to-have backup for bye weeks. Blue compiled 39 rushing yards on 15 carries during a 19-17 win against the Broncos on Sunday. 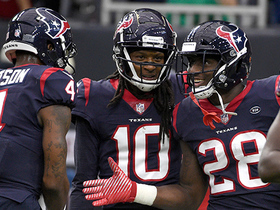 Blue rushed 15 times for 42 yards in the Texans' 42-23 win over the Dolphins on Thursday. Analysis: Blue logged eight of his 15 carries on Houston's final possession, helping move the ball from the Texans' 29-yard line to Dolphins' 42 while knocking 4:36 off the clock. The fifth-year veteran wouldn't normally see as high a workload he logged Thursday, but the sizable second-half lead helped ensure it. Blue figures to revert back to his usual volume versus the Broncos in a Week 9 tilt. Blue rushed for 28 yards on eight carries in Sunday's 20-7 win over Jacksonville. 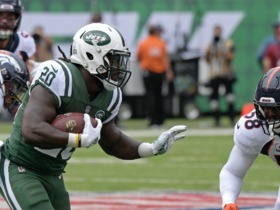 Blue had seven carries for 26 yards and caught two of three targets for 17 yards in Sunday's 20-13 win over the Bills. Blue rushed for 46 yards on 20 carries during Sunday's 19-16 overtime victory over the Cowboys. He also secured all eight of his targets for 73 yards. Blue will start Sunday's game against the Cowboys in place of Lamar Miller (back), who is listed as active but not considered likely to play, Adam Schefter of ESPN reports. Analysis: The report suggests Miller won't see much work, if any, unless there's an emergency situation. His active status nonetheless makes this a tricky situation, as it's a bit confusing why the Texans would keep Miller active if they don't think he's healthy enough to contribute. In any case, Blue seems to be in line for the start and most of the carries, with Tyler Ervin potentially stepping in for passing downs. Blue is first in line to start and handle most of the snaps at running back Sunday against the Cowboys if Lamar Miller (chest) is inactive, Aaron Wilson of the Houston Chronicle reports. Blue rushed for 31 yards on 12 carries during Sunday's 37-34 win over the Colts. Analysis: Ten of Blue's touches came in the fourth quarter and overtime with Lamar Miller sitting out. No injury was reported for Miller, but his status would obviously play into Blue's value. The fifth-year back was solid in a supporting role to start the season --scoring a touchdown in Week 1 -- but has averaged just 2.75 yards per rush over the past two weeks. If he sees extended time in Week 5, he's in for a tough matchup against Dallas' top-10 rush defense. Blue had four carries for 13 yards and caught his lone target for four yards in a Week 3 loss to the Giants. Blue carried seven times for 36 yards in Sunday's 20-17 loss to the Titans in Week 2. Analysis: Blue once again provided adequate relief for starter Lamar Miller, averaging 5.1 yards per carry after going for 7.2 per and scoring a touchdown last week. Unlike Week 1, he didn't get any red-zone carries, and the Texans never possessed the ball inside the five-yard line, where Blue could be used as the bigger back. Blue carried five times for 36 yards and scored a touchdown in Week 1's 27-20 loss to the Patriots. Analysis: Blue scored Houston's first touchdown, bouncing outside from the 1-yard line untouched as the offensive line sealed the edge nicely. He had started the drive, was replaced by Lamar Miller when Houston went into hurry-up mode, then came back into the game when the Texans got near the goal line. It's not clear if Blue will be the automatic choice inside the 5-yard line going forward, but as a bigger back, he could get his share of carries in the red zone. Blue rushed four times for 18 yards and a touchdown in Thursday's preseason win over the Cowboys. Blue rushed five times for 45 yards and a touchdown in the Texans' 21-20 preseason loss to the Rams on Saturday. Blue gained 17 yards on seven carries and caught his lone target for five yards in Saturday's preseason win over San Francisco. Analysis: Blue found little running room for the second straight week and added the ignominy of a fumble to his preseason log. He's done little to enthuse fantasy owners seeking the next viable option following starter Lamar Miller. If D'Onta Foreman (Achilles) is not available for the start of the season, Blue remains the most likely backup for Miller despite the uninspiring August numbers. Blue's durability puts him in position to be the primary backup to starter Lamar Miller while D'Onta Foreman (Achilles) is sidelined, Aaron Wilson of the Houston Chronicle reports. Blue had eight carries for 14 yards and dropped his lone target in Thursday's preseason win over the Chiefs. Analysis: Blue was the second running back used after starter Lamar Miller and was easily held in check by Kansas City's defense. That's been the knock on him throughout his career -- he doesn't make tacklers miss. If D'Onta Foreman (Achilles) was healthy, Blue's chances of making the roster would be minimal. As it stands now, Foreman is not guaranteed for Week 1, and Blue has more size than his main competitors, Tyler Ervin and Troymaine Pope. Blue's value on special teams should help him secure a spot on the 53-man roster, John McClain of The Houston Chronicle reports. Blue is signing a one-year contract with the Texans, Aaron Wilson of the Houston Chronicle reports. Analysis: A 2014 sixth-round pick, Blue had a stint as the Texans' featured back during his second pro season, but he was limited to 72 carries for 262 yards and a touchdown in 11 games last year. He'll provide insurance while D'Onta Foreman (Achilles) and Tyler Ervin (knee) recover from major injuries, though he ultimately may end up competing with undrafted rookies Terry Swanson and Lavon Coleman for a single spot on the 53-man roster. Blue's lack of speed and pass-game skills limit his upside. Blue rushed 18 times for 39 yards, scored his first touchdown of the season, and added 36 receiving yards on four catches in Sunday's 22-13 loss to the Colts. Blue rushed 16 times for 108 yards, but wasn't targeted in the passing game during Monday's 34-6 loss to the Steelers. Analysis: Just under half of Blue's yardage came on a 48-yard scamper in the first half. He could have had an even bigger game, but was denied on a direct snap from the one-yard line during a second quarter possession that ended with a T.J. Yates interception. Blue's recent emergence has to put some serious doubt in the minds of Lamar Miller's owners ahead of a favorable Week 17 matchup against Indianapolis. He got 16 carries to Miller's 10 in this one. 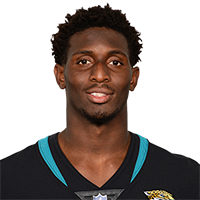 Blue carried 12 times for 55 yards and failed to bring in his only target during Sunday's 45-7 win loss to the Jaguars. Analysis: Blue set new season highs in touches and rushing yardage, thanks in large part to the lopsided nature of the game. He out-touched starter Lamar Miller and easily topped Miller's 3.6 yards per carry, but neither back was put in a position to succeed as the offense floundered under T.J. Yates. Blue could remain involved for the 4-10 Texans next week against the Steelers, but it's difficult to imagine him receiving enough meaningful work to post significant fantasy returns. Blue (concussion) practiced fully Wednesday. Analysis: Blue could thus re-enter the backup equation behind Lamar Miller on Sunday against the Jaguars, but that assignment doesn't carry much bankable fantasy upside in Week 15. Blue (concussion) has been ruled out for Sunday's game against the 49ers. Analysis: As expected, Blue was unable to practice this week and will sit out for the fifth time this season while he remains in the NFL's concussion protocol. Blue's absence leaves Andre Ellington to serve as the primary backup to starting running back Lamar Miller. Blue (concussion) didn't practice Thursday. Analysis: Per Aaron Wilson of the Houston Chronicle, Blue is "highly unlikely" to play Sunday against the 49ers. Assuming Blue is ruled out for the contest, Andre Ellington would serve as Lamar Miller's top backup Sunday, with Jordan Todman available as a depth option. Blue (concussion) didn't practice Wednesday. Analysis: Blue has a few more days to pass all phases of the NFL's concussion protocol in advance of Sunday's game against the 49ers. If he's unable to gain medical clearance for the contest, however, Andre Ellington and Jordan Todman would be on hand to back up top running back Lamar Miller in the Week 14 matchup. Blue suffered a concussion in Sunday's loss to the Titans, Aaron Wilson of the Houston Chronicle reports. Analysis: Blue managed five touches for nine yards prior to exiting, and must now clear the league-mandated concussion protocol. New addition Andre Ellington is likely to fill in as the Texans No. 2 running back behind Lamar Miller if Blue is forced to miss Week 14. Blue had eight carries for 15 yards and caught two passes for an additional 11 yards in Monday's 23-16 loss to the Ravens. Blue (hamstring) practiced without limitations Saturday and will be available Monday against the Ravens. Analysis: Behind Lamar Miller and D'Onta Foreman, Blue has only received 13 carries for 43 yards and no touches in the red zone. However, Foreman (Achilles) was placed on injured reserve earlier this week, possibly giving Blue more opportunities behind Miller. The Texans decided to bolster their depth with the pickup of Andre Ellington on Tuesday, though Blue should slot in as the No. 2 running back until Ellington fully learns the playbook. Blue (hamstring) was a limited practice participant Friday. Analysis: In the wake of D'Onta Foreman's ruptured Achilles, Blue is expected to take over as the top backup to starting running back Lamar Miller. First, though, Blue must overcome the hamstring injury that forced an absence this past Sunday in Arizona. If he does, he'll bring career marks of 3.6 YPC and an 84 percent catch rate into Monday's game at Baltimore. Blue (hamstring) is expected to take over as the top backup to starting running back Lamar Miller if healthy enough to play in the Week 12 game against the Ravens, Aaron Wilson of the Houston Chronicle reports. Blue (hamstring) is inactive for Sunday's game game against the Cardinals. 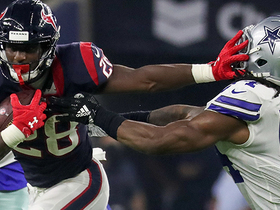 Analysis: Given that Blue is behind both Lamar Miller and D'Onta Foreman in the Texans' RB pecking order, his absence Sunday is of more import to the team's backfield depth in Week 11 than it is to fantasy players. Blue (hamstring) is listed as questionable for Sunday's game against the Cardinals. Analysis: Blue did not practice Friday, which clouds his Week 11 status. In any case, he's behind Lamar Miller and D'Onta Foreman in the Texans' RB pecking order, so he's off the fantasy radar in all but the deepest formats these days. Blue was added to the Texans' Week 11 injury report after being limited by a hamstring injury at Thursday's practice, the Houston Chronicle reports. Analysis: At this stage, Blue is behind Lamar Miller and D'Onta Foreman in the Texans' RB pecking order, so his status for Sunday's game against the Cardinals is of more import to Houston's backfield depth than it is to fantasy players. Blue carried four times for 10 yards in Sunday's 33-7 loss to the Rams. Analysis: Blue has been largely a special-teams player this season, but got a season-high 13 offense snaps in Week 10. His playing time came in the second half when the Texans were down by multiple scores, so we're reticent to view his usage in Week 10 as some sort of shift in the depth chart. He remains the third back behind Lamar Miller and D'Onta Foreman. 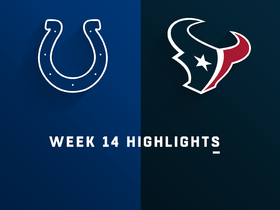 Blue was strictly a special-teams contributor in Sunday's 20-14 loss to the Colts. Analysis: Blue had been elevated to the No. 2 running back in the Texans' previous game, but was back to third on the depth chart for Week 9. Although head coach Bill O'Brien will never admit it, the change in Week 8, when Blue vaulted over rookie D'Onta Foreman on the depth chart, may have been a punishment delivered to the rookie, who had skipped a practice in protest of controversial remarks made by team owner Bob McNair. All is back to normal now with Foreman the No. 2. 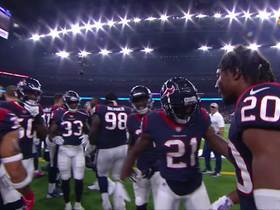 Houston Texans running back Alfred Blue opens the scoreboard with a 3-yard touchdown haul. NFL Network's "NFL Fantasy Live" crew highlights some of the top running backs to target on waivers in Week 12. Houston Texans safety Justin Reid is pumped up on the sideline after he picks off Dallas Cowboys quarterback Dak Prescott. Houston Texans running back Alfred Blue stiff arms defender to turn on 28-yard catch and run. 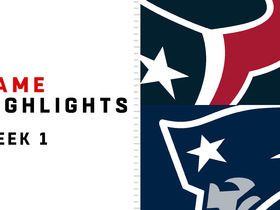 Watch the highlights from the Houston Texans-New England Patriots matchup in Week 1 of the 2018 season. Houston Texans running back Alfred Blue reads the defense well and bounces outside for a 1-yard touchdown.